Citation Information: J Clin Invest. 2016;126(8):2827-2838. https://doi.org/10.1172/JCI84491. Risk for ischemic stroke has a strong genetic basis, but heritable factors also contribute to the extent of damage after a stroke has occurred. We previously identified a locus on distal mouse chromosome 7 that contributes over 50% of the variation in postischemic cerebral infarct volume observed between inbred strains. Here, we used ancestral haplotype analysis to fine-map this locus to 12 candidate genes. 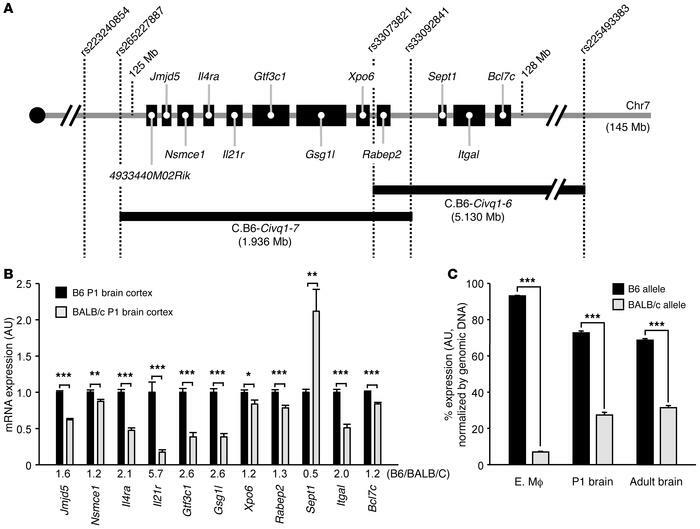 The gene encoding the IL-21 receptor (Il21r) showed a marked difference in strain-specific transcription levels and coding variants in neonatal and adult cortical tissue. Collateral vessel connections were moderately reduced in Il21r-deficient mice, and cerebral infarct volume increased 2.3-fold, suggesting that Il21r modulates both collateral vessel anatomy and innate neuroprotection. In brain slice explants, oxygen deprivation (OD) activated apoptotic pathways and increased neuronal cell death in IL-21 receptor–deficient (IL-21R–deficient) mice compared with control animals. We determined that the neuroprotective effects of IL-21R arose from signaling through JAK/STAT pathways and upregulation of caspase 3. Thus, natural genetic variation in murine Il21r influences neuronal cell viability after ischemia by modulating receptor function and downstream signal transduction. The identification of neuroprotective genes based on naturally occurring allelic variations has the potential to inform the development of drug targets for ischemic stroke treatment. Candidate genes for Civq1 and Canq1 and their strain-specific transcript levels. (A) Schematic showing 12 candidate genes mapping within the Civq1 and Canq1 loci. Two Civq1 congenic lines, C.B6–Civq1–6 and C.B6–Civq1–7, carry segments of B6 chromosome 7 introgressed into the BALB/c background. Together, these 2 congenic strains cover the entire candidate region of Civq1. (B) Transcript levels of each gene transcript in P1 brain cortex from B6 and BALB/c mice were determined by qRT-PCR. Gapdh was used for normalization. Values represent mean ± SEM from 7 B6 animals and 8 BALB/c animals. (C) The strain-specific mRNA expression level difference of the Il21r transcript. Graph represents allele-specific expression in tissues from F1 (B6-BALB/c) mice. A coding SNP (rs33008564) is used to monitor the allele-specific transcripts of Il21r in embryonic macrophage (MΦ) at E18.5, in P1 brain cortex, and in adult brain cortex. Genomic DNA was used for normalization. Values represent mean ± SEM from at least 3 animals per tissue (6 animals for embryonic macrophage, 5 animals for P1 brain cortex, and 3 animals for adult brain cortex). *P < 0.05; **P < 0.01; ***P < 0.001, 2-tailed Student’s t test.